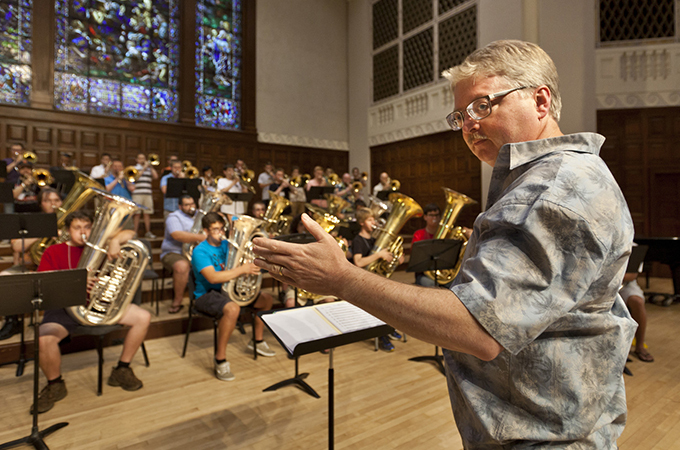 Andrew Glendening was the first person to be awarded the Doctor of Music in Trombone Performance degree from Indiana University, where he also earned the school’s highest honor, the Performer’s Certificate. These followed his studies in not only music but also physics as an undergraduate student at Oberlin College. “I’m interested in the science of how we interact with the trombone acoustically, physically, and psychologically,” Glendening explains. His curiosity also led to his 2017 textbook, co-authored with Julia Broome-Robinson, The Art and Science of Trombone Teaching, which is used by musicians worldwide. Glendening has premiered, performed, and recorded many works for computer and instruments and has lectured on interactive applications at such institutions as the Center for New Music an Audio Technologies at University of California, Berkeley, the Center for Experimental Music and Intermedia at the University of North Texas, and the Eastman School of Music. He is also the inventor of the Magneto-Restrictive Slide Position Sensor for the trombone, which allows for direct integration of the trombone and a computer both for performance and teaching. Glendening’s father played the trombone in Iowa for Karl King’s band prior to World War II. As a child, he picked up his dad’s trombone and soon discovered he had talent for playing the instrument as well. An active proponent of new music for the trombone, Glendening has premiered more than 100 works, including three concerti. In 1998 he was awarded Morehead State University's Distinguished Creative Productions Award for his solo CD, Pathways: New Music for Trombone. He is the principal trombonist of the Redlands Symphony Orchestra and has performed with the Chicago Symphony Orchestra, the San Diego Symphony Orchestra, and the California Philharmonic. Six of his former trombone students have won the U.S. Army Band National Solo Competition. Glendening also was host and artistic adviser for the 2017 International Trombone Festival.